Using our own exclusive fabrics and styles a Groom can create any look from the timeless elegance of traditional black tails to a fashion cut slim fit 3 piece lounge suit. All of our suits come with slim fit or regular fit shirts. We hold a vast range of accessories to hire, all hand made in our Essex factory, including cravats, wedding ties and handkerchiefs in silk, Duchess satin, jacquard and various patterns to compliment our range of waistcoats and suits. 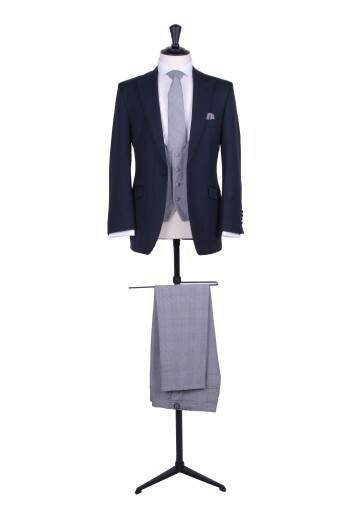 Choose your cloth from Holland & Sherry, Dugdales, loro piana or Dormeuil and then create your own suit. You control every aspect from lapel width to the length of your vents, from lining colour to the hand stitching on the button holes the choice is yours. We will guide you through the process from start to finish and help you achieve the look you want for the big day. The process takes 12 weeks from start to finish. Choose from a stunning range of Italian cloths then design your own shirt with hundreds of options in buttons, collars, stitching and embroidery. Choose your cloth from Holland & Sherry, Dugdales, loro piana or Dormeuil and then create your own coat. You control every aspect from lapel width to the length of your vents, from lining colour to the hand stitching on the button holes the choice is yours. We will guide you through the process from start to finish and help you achieve the look you want. The process takes 12 weeks from start to finish. Select your style from our own exclusive designs and choose the fabric, soul and finish to create your own bespoke shoe and we will ensure you have the perfect fit. The Anthony contrast range of light weight wool & mohair lounge suits are available with a selection of contrasting trousers and waistcoats. 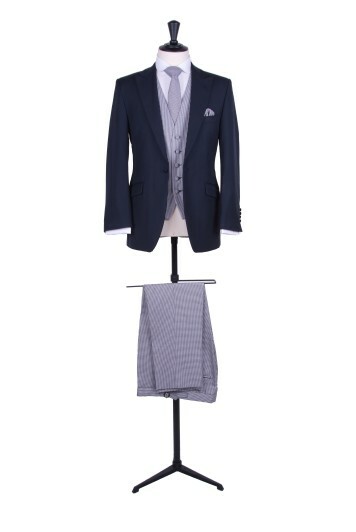 The trousers are cut in a contemporary slim fit style with narrow 16" bottoms, they can be worn with a matching waistcoat in classic, scoop & double breasted from our range. Sign up for news & offers. All Anthony Formal Wear branded accessories are made in our own UK factory. We support the 'Made in England' campaign. © 2019 Anthony Formal Wear - Wedding suit hire and tailoring. Magento Web Design by Measured Designs.